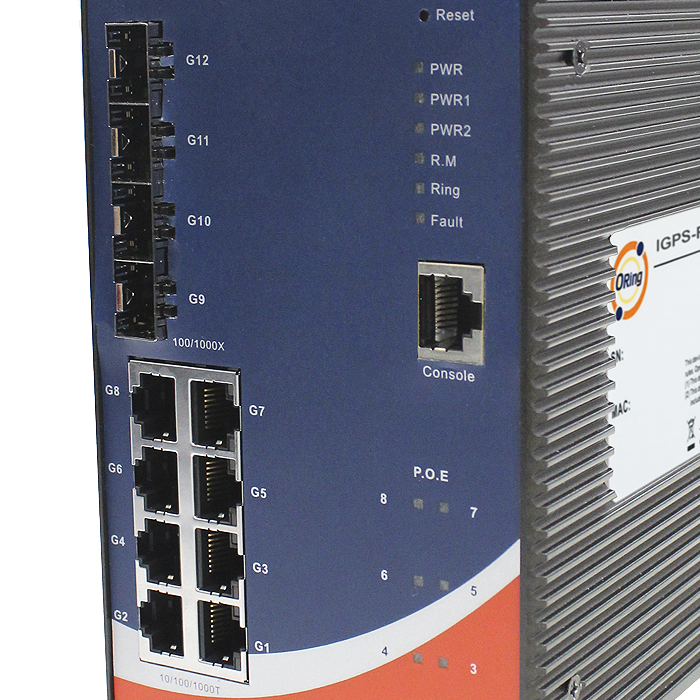 The IGPS-R9084GP is a Layer-3 managed, redundant ring, PoE Ethernet switch. It supports Layer-3 routing to offer better network performance on transferring large-scale LANs into multiple subnets to support long-haul and EMI immunity communications. The hardware Layer-3 switch is optimized to transmit data as fast as Layer-2 switches. 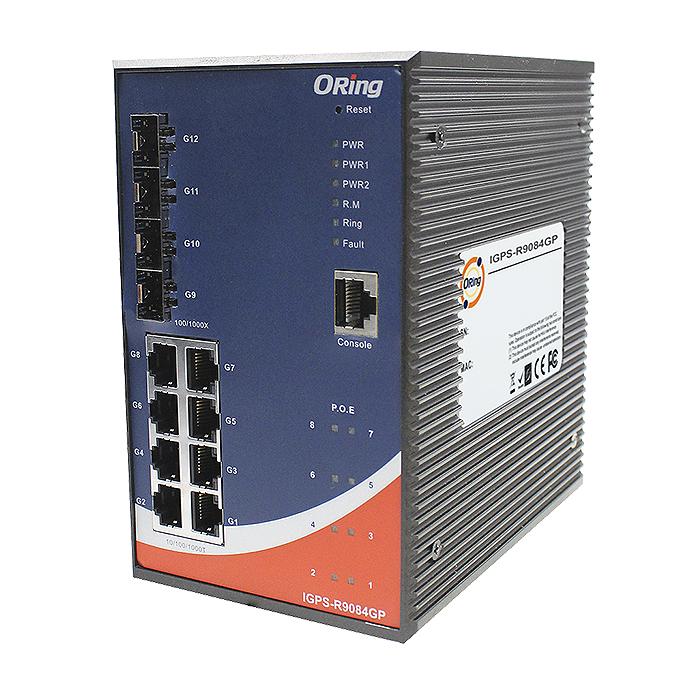 The switch support Ethernet Redundancy protocol, O-Ring (recovery time < 30ms over 250 units of connection) and MSTP (RSTP/STP compatible) can protect your mission-critical applications from network interruptions or temporary malfunctions with its fast recovery technology. The IGPS-R9084GP also supports Power over Ethernet, a system that transmits electrical power along with data, to remote devices over standard twisted-pair cables in an Ethernet network. Each IGPS-R9084GP switch has 8x10/100/1000Base-T(X) P.S.E. (Power Sourcing Equipment) ports. P.S.E. is a device (switch or hub for instance) that will provide power in a PoE connection and support wide operating temperatures from -40°C to 75°C. The IGPS-R9084GP can also be managed, centralized, and made convenient by Open-Vision, Telnet, and console (CLI) configuration. This switch is clearly the most reliable choice for highly-managed power operation and Fiber Ethernet applications. Green Blinking : Indicates that the Ring is broken.